Four Star Solar PV Centers combine photovoltaic control of large solar systems into a single, compact, easy-to-use unit. 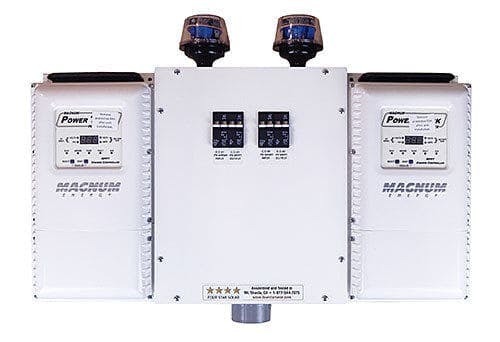 The PT-100 Double PV-center includes two US-made PT-100 charge controllers from Magnum Energy. The PT-100 controllers offer the highest output and also include advanced arc fault and ground fault protection features. The PT-100 Double PV Center is an easy to install, code-compliant solution for off-grid solar arrays. Multiple PV Centers can be stacked together for larger installations. These PV Centers come with a full five year warranty with years of expected service. Don't hesitate to call Wholesale Solar with questions at 1-800-472-1142.